Good morning Ladies and gentlemen – thank you for your warm welcome. Speaker Paulsen, President Jochum, distinguished members of the Iowa Senate and House of Representatives – thank you for the opportunity to once again address this joint convention of the Eighty-Sixth General Assembly of the Iowa Legislature. Governor Branstad, Lieutenant Governor Reynolds, distinguished guests, and fellow Iowans. Today, I deliver my sixth Condition of the Guard address and it is indeed a great honor and a privilege to provide this annual report on your Iowa National Guard. Today, I am proud to report that the Iowa National Guard continues to be “Mission Focused and Warrior Ready”. I want to begin by saying thank you – thank you to Governor Branstad, Lieutenant Governor Reynolds, and the Iowa General Assembly for your support and outstanding leadership during one of the most challenging periods of time in the history of the Iowa National Guard. Your efforts to attend our homecomings, sendoffs, military funerals and ceremonies, and for honoring the men and women who serve in the military through initiatives and events throughout the year, are deeply appreciated. Of particular note, your leadership efforts to make Iowa the “Most Veteran Friendly” state through the Home Base Iowa program and all of its components continues to move Iowa closer to the top of the nation for supporting our veterans and their families. and their young daughter, Sophia. Through Home Base Iowa, Brent was able to acquire civilian employment with Hy-Vee, where he’s the Supply Chain Security Manager. He also continues to serve part-time in the U.S. Air Force Reserve. Brent is just one of more than 1000 veterans who have used Home Base Iowa to achieve their dreams in Iowa, in no small measure because of the vision and commitment of Governor Branstad and the Iowa General Assembly. Our success is directly connected to what you have done for the members and families of your Iowa National Guard. I sincerely thank you. And I owe a very special thank you to the mothers and fathers who continue to show their support for the Iowa National Guard by continuing to entrust us with their most sacred treasure – their sons and daughters – and allowing them to serve. I don’t take this responsibility lightly. Nothing is more important or a greater testament to the vitality of our organization than for a parent to trust us with whom they cherish most. I will continue to do everything I can to honor that trust and strive to never allow it to be broken. And I want to thank the people of Iowa; your continued support for our Soldiers, Airmen, and families has been absolutely incredible, particularly over the past 13 years at war. State Representative and retired Brigadier General Dwayne Alons, a long-time member of both the Iowa General Assembly and the Iowa National Guard. A humble, quiet man whose bedrock values of excellence and service to others for the greater good extended across six decades in the state of Iowa, Dwayne left a legacy of public service that touched every Iowan, and was a champion for service members and their families. We miss him greatly. The members of the Iowa National Guard that make up our all-volunteer force represent our State and Nation’s decisive advantage to deal with any situation. And our competency depends on strong leadership. 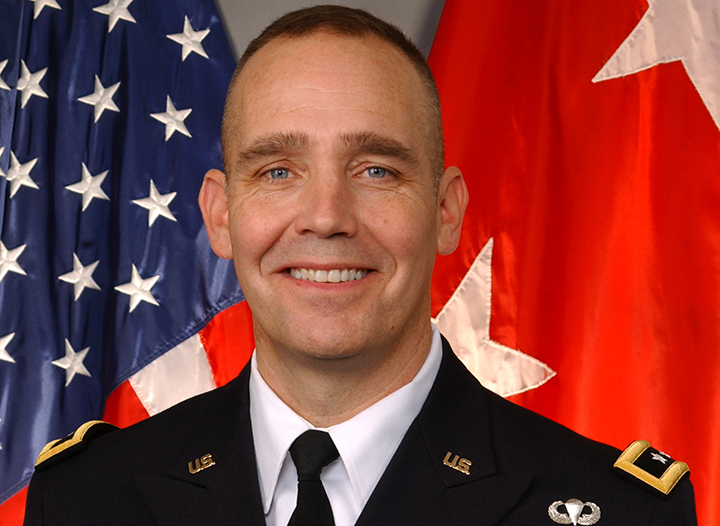 State Command Chief Master Sergeant Ed Schellhase, Iowa Air National Guard. Iowa Army National Guard State Command Sergeant Major Rachel Fails is on assignment and unable to join us today. Those who serve in the Iowa National Guard are the source of our unrivaled strength. Whether serving in uniform or as civilians, Iowa National Guard men and women remain vested in a culture of readiness and volunteer service. Today, there are no better opportunities for young men and women to serve their state and nation than in Iowa’s service of choice, the Iowa National Guard. We are an organization that provides individuals with the opportunities to serve, to learn new skills, to gain valuable education and training, and to better themselves and the world around them by taking a vow to rebuild the broken and defend the good. While it is my responsibility to ensure that there are opportunities for our men and women to serve in the Iowa National Guard, I must also continue to take care of our current servicemembers, their families and employers as they serve so proudly as your hometown military. The past 13 years have brought vast improvements in the overall training, equipping, and readiness of our force. This reality, combined with significant combat experience, has created a “dividend” in the Iowa National Guard. We have the most proficient, capable, accessible, and battle-tested National Guard in the history of Iowa. Today, the Iowa Army and Air National Guard is the best trained, equipped, and led organization in our 176-year history. Constitutionally unique by its dual federal and state missions, the Iowa National Guard remains capable and ready to rapidly respond to complex civilian and military challenges. Going forward, the need for the powerful capabilities the National Guard provides cannot be overstated. Today we live in a dynamic and uncertain world with challenges and threats that require the full capabilities of the Iowa National Guard and its adaptability to meet critical future missions. Our core missions will continue to remain: providing combat-ready Soldiers and Airmen for the global war fight and operational missions as required; responding here at home with robust homeland security and domestic response capabilities; making our communities better places to live; and building strong relationships with our partners. Throughout the long history of the Iowa National Guard, we’ve seen tremendous technological changes, from horse-drawn wagons to unmanned aircraft remotely piloted halfway around the world. But the one constant that will never change is the importance of our people. The demand for Iowa National Guard forces over the past three decades has required almost continuous use of our Soldiers and Airmen. In the last 13 years, we’ve mobilized more than 17,000 Soldiers and Airmen for combat and combat support duties in Iraq and Afghanistan, peacekeeping duties in the Balkans and on the Sinai Peninsula, and for other operational missions around the globe. Approximately 3,700 currently-serving Iowa National Guard Soldiers and Airmen are combat veterans, more than 42 percent of our force, the highest percentage in modern history. And our men and women have operated in more than 35 different nations since 9/11. However, since the large brigade-level deployment from Iowa in 2010-2011, we’ve seen a significant decline in the demand for Iowa National Guard forces. Currently we have approximately 150 Soldiers and Airmen deployed around the world, which is the lowest number of deployed service members from the Iowa National Guard since the start of Operations Enduring and Iraqi Freedom. Last June, approximately 60 Soldiers assigned to Company C, 2nd of the 147th Aviation from Boone, deployed to the Middle East in support of Central Command and its operational missions throughout that theater. We expect these Soldiers to return to Iowa in late Spring 2015. The 185th Air Refueling Wing from Sioux City continues to provide ongoing refueling support of real-world missions to the Air Force, Army, Navy, Marine Corps, and coalition forces. In the past year, the 185th has deployed more than 220 Airmen in excess of 15,000 active duty days around the globe executing operational missions. During this deployment cycle, Airman from the 185th deployed to 10 countries in support of Central Command operations, flying 220 missions for 1,450 flight hours, while refueling coalition aircraft with more than 11 million pounds of fuel. In addition to the unit’s normal deployment operations, they received an extremely short notice mission to support additional combat operations in the Middle East, which they filled in less than a week with 100% volunteers. Here at home, the unit also provides more than $80 million in economic impact to the Siouxland community and the state of Iowa. Two years ago, President Obama announced his intention that the United States military would withdraw a significant number of personnel from Afghanistan by the close of 2014. Approximately 11,000 U.S. military personnel currently serve in Afghanistan, as compared to more than 100,000 at the apex of U.S. involvement in mid-2011. It is anticipated that the U.S. presence will continue to shrink in Afghanistan over the next year. We are now at a point where current and projected demands for Army and Air Force assets around the globe may continue to decrease, depending on the needs of the nation. That fact recently hit home in Iowa with the cancellation less than two weeks ago of the West Africa ebola deployment for the 294th Area Support Medical Company in Washington, Iowa. We currently have no Iowa National Guard units identified for potential future overseas deployments in 2015, a first for our organization since 2000.
not forget about those still recovering from wounds, injuries, or illnesses related to their mobilizations. Over the past year, 18 of our wounded, injured, or ill Warriors back from deployments have received medical care, either at military treatment facilities across the country or from health care providers in their local communities. Today, I am proud to say we continue to make progress with only two Soldiers currently receiving treatment at these facilities. However, for me, the mission is not over until all of our Soldiers have returned back home to their families. With the reduction of deployment requirements for our forces, new emerging missions continue to make the Iowa National Guard even more relevant today at home and abroad. We continue to make great progress on the conversion of the 132nd Fighter Wing, Des Moines, from F-16 fighter aircraft into their three new, enduring missions: a Remotely Piloted Aircraft group; an intelligence surveillance reconnaissance group; and a cyber security squadron. The 132nd has executed every task required of them for this conversion and is ahead of schedule to complete a very complicated transition process and begin initial operations later this year. schools at various installations across the U.S., gaining valuable training in imagery analysis and cyber security that will translate well into Iowa’s growing technology sectors. As the unit provided more than $70 million in economic infusion to Iowa last year through salaries, unit purchases from the local economy, and indirect job creation, retaining these highly-skilled Airmen and this unit at the Des Moines Airport significantly benefits Des Moines and the entire state of Iowa. Additionally, current and future military construction necessary at the Des Moines Airbase for the mission conversion over the next several years is estimated at $15-20 million, which will provide additional economic benefit for local builders and suppliers. Despite the departure of the last F-16 fighter jet this past September from the Des Moines speed line, aeronautical missions continue at the airbase. In December, the 132nd received a RC-26 reconnaissance aircraft to be stationed at the airbase and flown by Wing personnel. The RC-26 will provide 132nd pilots with the capability to maintain their pilot proficiency, while at the same time providing the state with an additional operational capability for use during disaster operations. Another way we’re supporting and adapting to the changing global and operational environment is through the National Guard’s State Partnership Program, or SPP. The Iowa National Guard’s State Partnership Program with the Republic of Kosovo continues to make great progress since its creation in March 2011. Since the inception of our partnership with Kosovo, we have expanded our vision of a “Whole of Iowa/Whole of Kosovo” relationship and have conducted more than 70 engagements over the past three years between Iowa government and private entities, the Kosovo Security Force, Kosovo’s Ministries of Agriculture, Health, Education, and Economic Development, and other Kosovo agencies. Another tangible sign of progress in the development of this relationship is the possibility of an enduring presence of our Kosovo friends in Iowa in the near future. Governor Branstad and leaders with the Republic of Kosovo have discussed the feasibility of Kosovo’s first consulate and trade office in Iowa, which could greatly expedite trade and other opportunities between Kosovo and Iowa. But what anchors everything we do, whether in 1839, today, or in the future, is readiness. The Iowa National Guard has been able to maintain our position as a national leader in readiness among our fellow states because of programs like the Iowa National Guard Educational Assistance Program, a program funded in its entirety by the state of Iowa. This year, nearly 1,200 of our men and women received up to 100% tuition paid at the State Regents’ rate to attend Iowa colleges, universities, and community colleges through this program, keeping our young people here in the state and providing them with a high-quality, Iowa education. This critical recruiting and retention tool helps ensure our readiness and provides an invaluable benefit to our Soldiers and Airmen. In addition to high-quality Soldiers and Airmen, we also need multifunctional and well-maintained infrastructure to keep the Iowa National Guard ready for the warfight and for emergency response here at home. On Camp Dodge, this past year we completed the transition of the National Maintenance Training Center to the Sustainment Training Center. This one-of-a-kind, world-class training center provides individual qualification and turn-key, unit- level sustainment training for National Guard, U.S. Army Reserve and Active Duty Army logistical, ordnance, maintenance, transportation and medical units. The Medical Simulation Training Center on Camp Dodge, one of just 18 Army medical simulation facilities worldwide, reached full operating capability in 2014 and provides standardized emergency medical training to military and law enforcement personnel through a combination of realistic, hands- on and virtual battlefield simulated conditions. Through a variety of training initiatives, Camp Dodge has become a significant regional training center in the Midwest. More than 450,000 service members, law enforcement officers, and civilians visited Camp Dodge last year, whether for training, the Summer Concert Series or other events on post, or to visit the Iowa Gold Star Military Museum. In 2014, only three other major National Guard training installations in the United States had more visitors than Camp Dodge. Since 1839, protecting Iowa’s citizens and communities has remained a core mission of the Iowa National Guard. I am very pleased to report that 2014 has been a relatively quiet year for our emergency response operations. We used this additional time to plan, prepare, and exercise for potential disaster response support on a variety of scenarios. Last year my disaster response priority for the team was the development, synchronization, and rehearsal for a large scale, catastrophic tornado in our state. United States Northern Command in order to more fully exercise and assess our response capabilities for multiple disaster scenarios. In addition to Vigilant Guard, last week the Iowa National Guard hosted a cyber security workshop to begin developing a comprehensive cyber incident response system for the state. This forum was the first of its kind in Iowa, with more than 60 participants from multiple Iowa agencies working together to improve coordination between state agencies on cyber security incident management and response, enhancing information sharing during cyber incidents, and collaborating on how to best safeguard the citizens of Iowa from cyber attacks. The additional time we gained over the last year from quieter-than-normal combat, peacekeeping, and domestic operations has allowed our organization to re-focus on organizational readiness, which drives everything we do. I would like to share the results of these efforts with you. First, your Iowa National Guard is a national leader in the “quality” of the Soldiers and Airmen that we recruit. We are in the top echelon of the National Guard for the quality of recruits into the National Guard for 2014. More than 22% of our Basic Training, Advanced Individual Training, or technical school graduates are either honor or distinguished graduates, on the commandant’s list, or in the top 10% at their respective military schools. -The 185th Air Refueling Wing received the Mobility Air Force Fuel Efficiency Award for KC-135 aircraft, which is awarded to only one Air Force unit annually for superior fuel efficiency. -Captain Kathy Barton was selected as a General Douglas MacArthur Leadership Award recipient, one of just 28 company grade officers chosen across the entire U.S. Army. We are humbled by these prestigious national awards presented for excellence across the organization. Conversely, we have been so fortunate to recently recognize others for their honorable and selfless service to our nation. most significant U.S. action in Europe during WWII, these exceptional Iowans were recognized and presented with certificates and commander’s coins for their selfless and honorable service during that horrific battle. For some of the honorees, it was the first time they had ever talked in any detail about their experience and hardships, providing a measure of healing long overdue. Those in the audience learned first-hand about the true price of the freedoms we take for granted. What a great tribute to these tremendous veterans and their families. As I come to a close, I hope I have left you confident that the Iowa National Guard is in good hands and is moving in the spirit of one. We have executed every mission assigned, served our state and communities here at home, and deployed wherever needed in a moment’s notice. I am very proud of our Soldiers, Airmen, their families, our rich heritage, and our resolve as we continue our role in the preservation of the ideals upon which our nation and state were founded. The Iowa National Guard is postured to rise to new challenges, but we will remain focused on the fundamental mission of the Iowa National Guard: Defending America—at home and abroad. We will continue to provide affordable, flexible, tailored and community-based solutions to national defense and domestic response, and remain a critical reserve component for the Army and the Air Force. On behalf of our men and women and their families, I want to thank you for this opportunity today to provide an update and assessment of the Iowa National Guard.